Borough President James Oddo says he wants bike-share for his constituents, but in his time in elected office, he’s done little to make bicycling conditions safer on Staten Island. As borough president, Oddo has shifted his tone somewhat, signaling support for a bike path on the Verrazano Bridge and releasing a proposal for Richmond Terrace, one of the island’s most dangerous corridors, showing bike lanes along a one-way bus lane. Earlier this year, he also co-sponsored a “hack-a-thon” at TransitCenter to rethink the borough’s outdated bus system. At the same time, Oddo raised a stink this summer about DOT’s speeding enforcement cameras, and his default response to the borough’s growth is to call for road-widening projects. 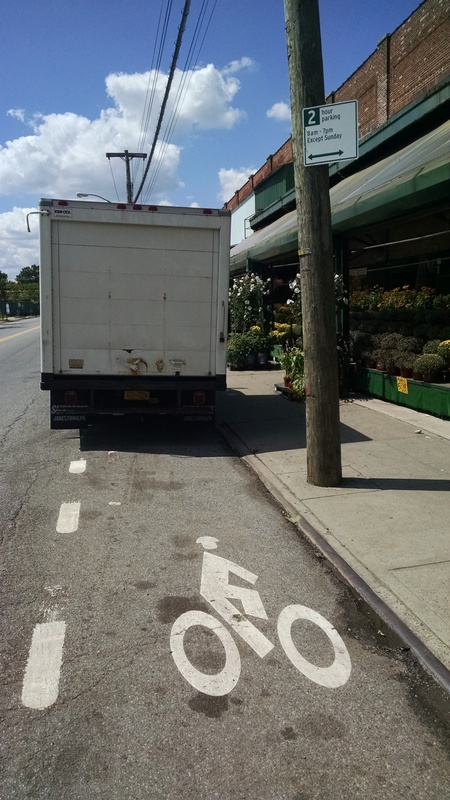 Safe streets for biking don’t have much of a place yet in Oddo’s plans for addressing the borough’s traffic problems. Nevertheless, in testimony to the City Council last Monday and in a subsequent Daily News op-ed cowritten with Bronx Borough President Ruben Diaz Jr., Oddo said he wants bike-share for Staten Island. “It’s great that he’s looking at the bigger picture and trying to create more transportation options for Staten Island,” said Transportation Alternatives Staten Island organizer Greg Mihailovich. But Mihailovich also pointed out that the area along the shore by Richmond Terrace and Bay Street, where Oddo wants to site stations, lacks good bike infrastructure. The corridor has some bike lanes and markings, but they are skimpy. Bay Street is mostly sharrows and Richmond Terrace’s bike lanes are frequently blocked by illegally-parked vehicles. Inland, a recently painted bike route on Clove Road is an improvement, but still includes a lot of sharrows and is susceptible to obstruction by illegally parked vehicles. Interest in bicycling is on the rise on Staten Island, with the share of borough residents who bike regularly increasing from 10 to 13 percent between 2007 and 2014, according to a recent Health Department survey [PDF]. Without a network of streets that’s safe for all ages and abilities to bike on, however, bigger increases will be tough to come by. Oddo hasn’t called for more bike lanes and more physical protection to fix the problems with the borough’s bike network, but he did tweet in frustration when he noticed the number of motor vehicle lanes on Clove Road being reduced to make way for a bike lane. This is a nice way of justifying not advocating for transportation equity on the borough you folks support least and know least about.